AA6E Station Log: The Beagle Barks! 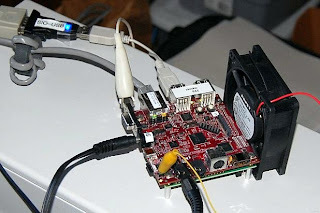 What a great project if it could be brought down to something like the US$20-35 PogoPlug embedded Linux platform. These support USB interfaces that might be used for local radio interfaces while the actual video and audio output are the computer on the Remote end. Byron, Thanks for the comment. Later, if we want to shrink the footprint and cost, I would look at the new "BeagleBone" board. Depending on settings, the Speex compression takes about 30% of the BB CPU, and future SDR work might take more. It's also nice to be able to run all the Linux tools on this board.